SOUTH HADLEY – Families are invited to visit the South Hadley Public Library on Wednesday, April 18 for a free program where local author David Rottenberg will read his children’s book, “Gwendolyn, the Graceful Pig,” while dancers from the Massachusetts Academy of Ballet in Holyoke make the tale come alive. “Gwendolyn, the Graceful Pig” tells the story of two best friends, Gwendolyn and Omar, who both have big aspirations to do what they love. Gwendolyn dreams of being a ballet dancer while Omar wants to join a football team and show off his skills. However, being pigs, they are unsure of what they are capable of doing. The story has inspired many children who have experienced the tale of Gwendolyn at their local library or at special events such as birthday parties. Both girls and boys will be thrilled to learn about the tale of how two best friends followed their dreams to do what they love. Children will become inspired as they hear the uplifting journey of the two pigs, while ballet dancers interpret the story into movement, miming different parts of the tale. Books will be available at the library for a price of $10 after the book reading and ballet performance is over. After the program, Rottenberg will be available to sign the inspirational, beautifully illustrated book. Rottenberg, a graduate of Columbia University and Natick resident, has published a novel, a book of poetry and has co-authored three business books. In addition to these achievements, Rottenberg has also written for publications such as Boston Magazine and the Boston Globe, along with many other poetry magazines throughout the United States. Families are encouraged to come early in order to snag good seats, as there is no pre-registration necessary. The program is free. 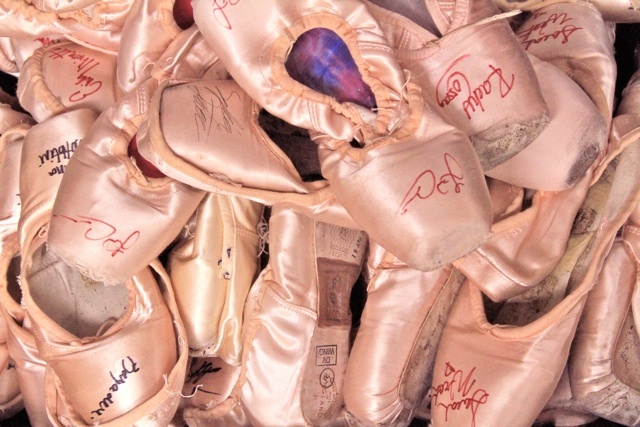 It will begin at 11:30 a.m.
WHAT: Reading of “Gwendolyn, the Graceful Pig” with ballet performance. WHEN: Wednesday, April 18 at 11:30 a.m.
WHERE: South Hadley Public Library, 27 Bardwell St., South Hadley. SOUTH HADLEY – Rachel Maddow wants a large, nation-wide discussion about what consequences come with continuous American wartime coupled with increasing presidential power. And on Saturday, she kick-started that conversation with a visit to Mount Holyoke College, where she read excerpts from her new book, ‘Drift,” and took questions from an eager and awestruck audience. Maddow, host of MSNBC’s “The Rachel Maddow Show,” is no stranger to the area. The part-time Western Mass. resident got her start in broadcasting at WRNX in Holyoke and at WRSI in Northampton. In 2004, she began working as a host at Air America Radio. Then, in 2008, Maddow became a political analyst for MSNBC. A Rhodes Scholar, Maddow earned a bachelor’s degree in public policy from Stanford University and received her doctorate in political science from Oxford University. 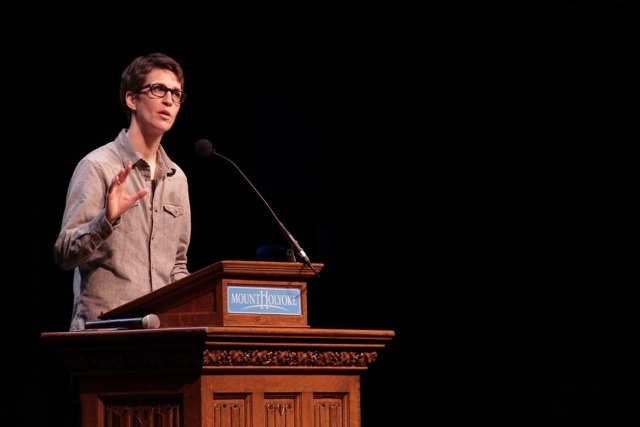 Upon appearing on stage in Chapin Auditorium last Saturday, Mount Holyoke students promptly sang “Happy Birthday” to Maddow, who turned 39 on April 1. Her first-ever book, “Drift: The Unmooring of the American Military,” spans political party lines and delves into the politics – and cost – of going to war and staying there. Emphasized by Maddow that it’s not about Democrats or Republicans, or about the good or bad guys, she probes the prospect of perpetual war, something which she says Americans have most recently found themselves involved in for quite some time. She argues that in the past, peacetime was a default and war was an aberration. But now, “that’s been flipped,” she said. 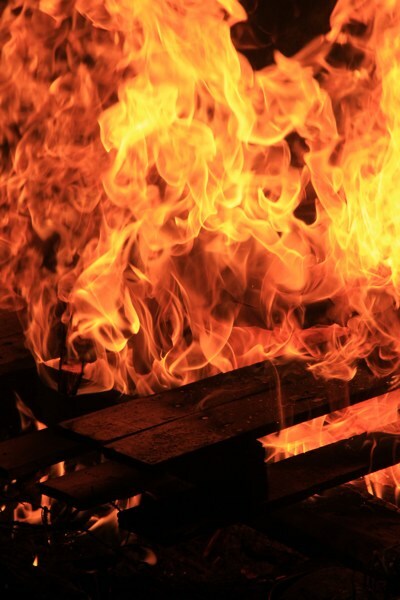 Blame is not placed on one particular president, but each has continued to dig the figurative hole that much deeper, beginning in the era of Lyndon B. Johnson and the Vietnam War. Maddow took a slew of questions from audience members young and old, student and retiree alike, offering substantial answers to their hefty, intelligent questions. When confronted about certain sections in the book or on reasons why she left out particular parts, Maddow answered straightforwardly and with much explanation. The speaking event was a collaboration among the Odyssey Bookshop, the Five College Women’s Studies Research Center and the Gender Studies Department at Mount Holyoke College. Maddow’s “Drift” can be purchased locally at The Odyssey Bookshop in South Hadley. SOUTH HADLEY – MetroPCS, along with Global Tower Assets, are proposing the construction of a cell tower to be located at 300 Newton Avenue behind Carey’s Flowers in order to improve wireless service in the area. The groups are seeking a Special Permit from the Planning Board to allow the construction of a 130-foot high wireless communications facility. Currently, there are no other buildings in that area that come close to that height. To go along with the Special Permit, the applicant is looking to receive a waiver that would allow the tower to be closer to residential property than the Zoning Bylaw allows. Proposal documents submitted by the applicants note the facility is intended to be located on a commercial parcel of land which previously hosted a greenhouse. The idea is the cell tower will enhance the ability for both residents and professional business owners in the area to communicate. According to the submitted documents, “an estimated 70 percent of 911 calls are placed from wireless phones” with that percentage on the rise. Applicants cite the ability to call 911 at anytime as one of the main reasons most Americans carry a cell phone with them at all times. “The fact that they submitted an application suggests that they feel it will enhance the MetroPCS ability to serve their customers,” said Harris. “The applicant has not proposed constructing a building, but to plant some vegetation for screening, install a fenced equipment compound, and erect a 130-foot tall tower,” said Harris. Once the construction is completed, there will be no one manning the facility. Once or twice a month, according to the Master Plan Statement submitted by the applicants, there will be a check-up from a MetroPCS technician. Other than that, “any job creation would be temporary during construction,” said Harris. The Master Plan Statement conclusion describes there is a significant service gap in the area of South Hadley. By placing this tower at the proposed location, residents, businesses and travelers would all benefit from the improved wireless service. Despite the wireless service improving for users, many residents from the Pershing Avenue neighborhood have already voiced their concerns to the town about the proposed cell tower. A public hearing will be held Monday, April 9 at 6:45 p.m. in room 204 of Town Hall. The public is welcome to attend, ask questions and voice their concerns. WHEN: Monday, April 9 at 6:45 p.m.
WHERE: Town Hall, room 204.